Sadly, Jonathan Harvey passed away last December and so did not look like we would get to see the staged premiere of Wagner Dream. After discussion with the composer WNO chose to present the opera in German and the ancient Pali, belonging to the Prakrit language group. It is widely studied because it is the language of many of the earliest extant Buddhist scriptures. The story within the opera is concerned with Wagner’s dying. He has had a row with Cosima about the visit of a singer. Wagner goes back to writing the essay he was working on. He thinks back to an opera that he hasn’t written on a Buddhist theme. Wagner imagines that he can see Vairochana who becomes Wagner’s guide, tell him that the state of one’s mind at the moment of death is important to one's incarnation. Wagner regrets not having written his opera and decides that he must remedy this. He therefore sees the opera in his mind’s eye. At this point the opera becomes an opera within an opera. The story of the opera that Wagner imagines concern a serving girl, Pakati. Whilst working in a inn she is approached by a young monk, Ananda who asks her for a cup of water. She tells him that that she cannot serve him as she is from a lower caste. He tell her that he doesn’t care and she falls in love with him. Pakati’s mother encourages her daughter’s affection and Ananda is invited to their home for a meal. When the Buddha shows up at the home he makes Ananda, a vision of Pakati in which he resembles the terrifying goddess Vairayongini. Ananda leaves the house. Pakati asks the Buddha if she can join his disciples so as to be with Ananda the Buddha explains to her that women are not allowed to be disciples and Pakati tried to take Ananda away by force. The Buddha explains that in a past life Pakati was the daughter of a court priest and had met a young man (Ananda) who fell in love with her. But she scorned his advances and the boy lived the rest of his life unmarried. Hear this Pakti threatens to take her own life and will reduce the earth to ashes. 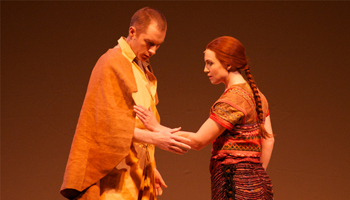 Anando pleads with the Buddha to admit her to his order. Eventually the Buddha agrees. Finally we return to Wagner who has grown weaker and doubtful of his ability to write the opera. He is reconciled with Cosima and asks for her forgiveness; he dies peacefully. This is an outstanding work by one of Britain’s leading composers. The major attraction was whether WNO could pull off a multi lingual experiment. I wasn’t too convinced by the Pali, though it was sung brilliantly. The orchestra was small with electronic music used to great effects. The problem is that Pali is a literal language, but the music is some of the best I have heard and extremely emotive. Although quite a short opera Wagner Dream certainly has all the splendour of a grand work. 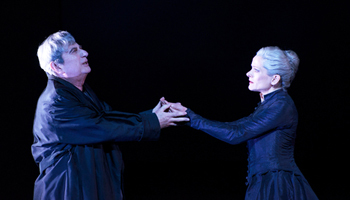 The cast were outstanding both the actor Gerhard Brösser as Wagner and Richard Wiegold, Bass, as Vairayongini. Welsh National Opera have given the world of music with this outstanding production of an opera, destined to become a classic.